This book started out as a 3-star rating for me, and by the second half, it worked its way up to a four-star rating. Then came the five-star ending, which I really liked. I figure it rounded itself out to a solid four and a half stars. This is my second audiobook, and the narrator had an accent for Elena's(mc) voice which I found weird at first but eventually really came to like her narration style. She did other voices excellently. 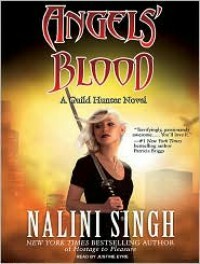 This is the first book in the Guild Hunter's Series, by Nalini Singh. This story gives a lot of background for the series, and I found a source on the internet that lists all the characters in the series. It can be found here...Guild Hunter Character Guide. This helped me immensely to keep all the characters organized in my head, especially since I was listening on Audio. The world of the Guild Hunter Series is a complex one. There are the archangels, the angels, the vampires, and the Guild Hunters. Angels rule over humans and vampires, but the most powerful of them all are the archangels. Beautiful. Deadly. Sometimes cruel. Always unpredictable. Angel's Blood is about human/guild hunter Elena and Archangel Raphael...it is a story of how they meet...but it is only the beginning of their story...looking forward to more of it.